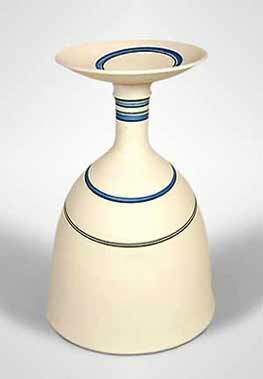 John Buchanan vase II - 14" (355 mm) high. John Buchanan, born in 1943, joined Anthony Richards at Arch Pottery in St Ives in 1961 to learn how to throw. He stayed at Arch until 1966 when he set up Anchor Pottery at Hayle. He moved the pottery to St Ives in 1971 and then in 1976 to Halsetown on the St Ives to Penzance road, where it is still to be found. He uses both gas and electric kilns. John lectures at St Austell College and is involved in adult education and pottery workshops. He also teaches at Lostwithiel Community Centre, Trenaren College, and runs pottery and painting courses from his home in Halsetown. John was also involved in a National Trust project at Saltram, Plympton where members of the public were invited to try their hand at throwing pots for £1.50 a time. Anchor Pottery was started by John Buchanan in Hayle, Cornwall in 1966. Hayle was once a very important port and commercial centre. It was the place where Ian Trevithick developed his steam engine. By the 1960s, though, it had begun its decline as a trading centre. In 1971 John closed the pottery in Hayle and moved to nearby St Ives, and then in 1976 moved to his current location in Halsetown on the road from St Ives to Penzance, the B3311. Anchor Pottery runs courses for potters and artists as well as producing domestic wares and studio pieces in stoneware and porcelain. An anchor mark is used for the the standard ware and a JB monogram for the studio pieces.